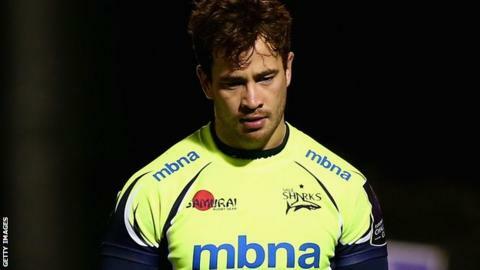 Fly-half Danny Cipriani's form will be recognised by England coach Eddie Jones if he continues to play well, says Sale boss Steve Diamond. The 28-year-old, who was not chosen for the Six Nations, put in another fine display in their European Challenge Cup win over Newport on Thursday. Asked about his performance, Diamond said: "He was outstanding, wasn't he? "I think the England coach has picked his team probably a fortnight early with the way Cipriani's in form." He added: "All he's got to do is carry on doing that and he'll get some recognition, no doubt." Cipriani put in a flawless kicking performance, as well as producing a superb grubber and take to set up Nev Edwards' score, in the 38-5 victory over Dragons. Sale ran in a total of five tries against the Welsh side in their final pool game of the European Challenge Cup, which was their biggest win of the season so far. "It's the first time we've really put a side to bed," added Diamond, whose team also secured top spot in the group and a home quarter-final. "We're confident of our own abilities at the minute and tonight lots of things came together - the forwards were dominant, what [Sale attack and kicking coach] Paul Deacon's been doing with the backs worked and we're line-breaking well. "We've got to come back down to earth as we've got London Irish next week and they're a totally different kettle of fish, fighting for their lives. "We need to put these performances together and if we can string some back-to-back wins together, because we can certainly do it at home, we can challenge for the top four."